A veneer is a thin layer of porcelain designed to improve the overall look of your teeth. Veneers are placed in the visible areas of your smile to cover imperfections, such as stains, chips, cracks, or misalignments. 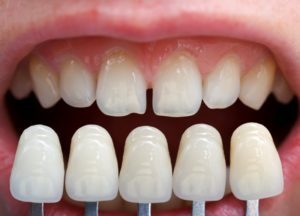 Since veneers are custom-made for each patient, they can be made to mimic the color, translucency, and shape of your other teeth, allowing it to blend in easily. Unlike making dramatic changes to your teeth like long-term realignment, veneers offer a quicker solution for those looking to improve their smile. The process is less invasive than orthodontic methods and tends to be less costly. This of course depends on the amount of work you want done. First, you’ll speak with your dentist about which teeth you want covered and which products you’d like to have placed. Then, your dentist will take an impression of your teeth so they can create a veneer that matches. After this mold is sent to a lab, they use it to fabricate a veneer using the mold as a model for your mouth. This ensures the veneer will fit properly on top of your tooth. Once the veneers arrive at your dentist’s office, they’ll bond the veneer to your mouth using a bonding resin technique. Prior to this placement, the dentist will need to buff your existing tooth so they can make room for the veneer. This entails injecting an anesthetic into your mouth prior to buffing. However, this process is not necessary for all veneers when straightening teeth. How Can They Make My Smile Straighter? If you have gaps in your mouth or teeth that have come in crooked over the years, you’ll quickly find out you’re a perfect candidate. These gaps are easily covered with veneers and crooked teeth are covered in as little as two visits, making no one the wiser of your previous smile. If you want to avoid removing your enamel through buffing and having to receive injections, options like Vivaneers No-Prep veneers are an ideal solution. These veneers are only 0.3 millimeters thick, meaning shaving down your enamel is not necessary. You won’t experience any discomfort while these are being placed, so you can rest at your next dental visit. Get the smile you’ve always dreamed of with porcelain veneers in Brookline today! Dr. Alan Sasson is an expert in cosmetic, restorative, and implant dentistry with over 25 years’ experience. He earned his dental degree from the Goldman School of Graduate Dentistry and is a member of many dental organizations, including the American Academy of Cosmetic Dentistry and the International Academy of Dental Facial Esthetics. To learn more about his practice and porcelain veneer treatments, contact him at (617) 739-1017 or visit his website.